Amanda is the designer and maker behind Attic 166, a brand that not only sells knitwear patterns, but also hand-woodburned knitting needles and crochet hooks. 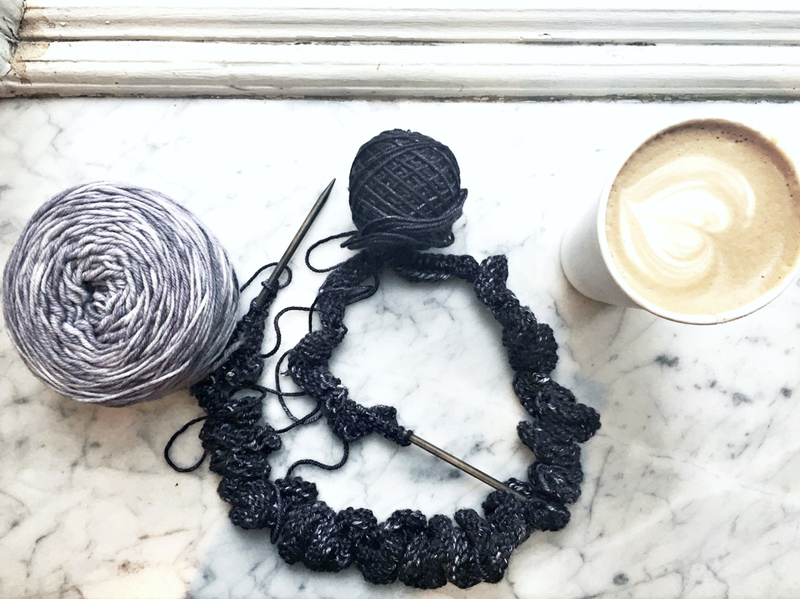 When she isn’t knitting, she loves exploring the outdoors, collecting antiques, and brushing up on her true crime knowledge - but to be fair, she’s probably knitting while doing all of these things, too. Join Amanda on her knitting adventures by following her on Instagram or checking out her shop. I started knitting at about 10 years old when my best friend’s grandma taught us how two sticks and string could make so many beautiful pieces. My first ever knitting needles were two pencils; since there were no extra needles laying around for me to learn with, I improvised. Well, those pencils got me addicted to this new craft and I couldn’t stop. I knit mainly for myself, friends and family until I started college and decided I wanted to start selling my knitwear. Around that same time I moved up into the attic apartment of my parents’ house, which has a house address number of 166 - causing the brand name “Attic 166” to be born. I eventually got bored of creating the same product over and over again, so I decided to try my hand at designing. I love nature and the outdoors, so you’ll find that most of my pattern names and inspiration link back to that part of my life. Knitting has not only given me a creative outlet, but an awesome community of people. I look forward to the many years of making, creating, and relationship building that this craft has so generously provided. Herringbone is my absolute favorite stitch to use while knitting, so I finally decided to work it into my own pattern design. 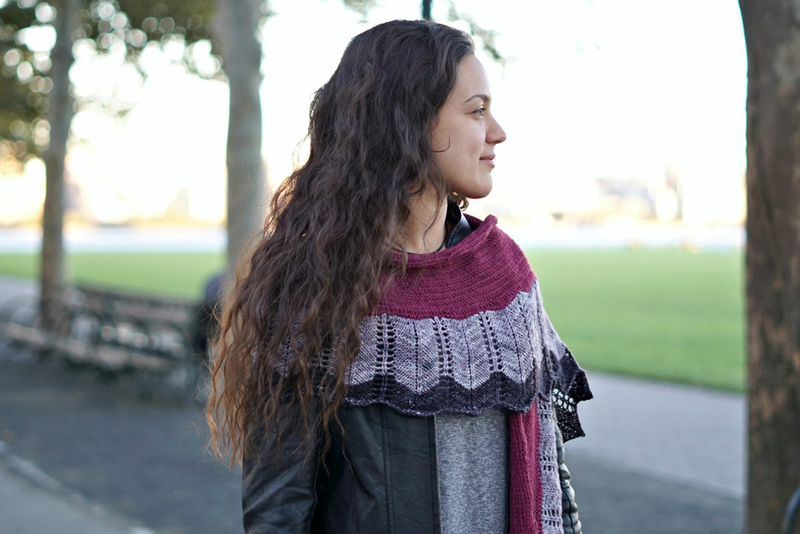 This is a bottom-up, rectangular shawl in which the edging has a beautiful scallop detail. The three colors and two different herringbone-esque stitches create for a timeless shawl that can wrap you up in the colder months no matter the occasion. 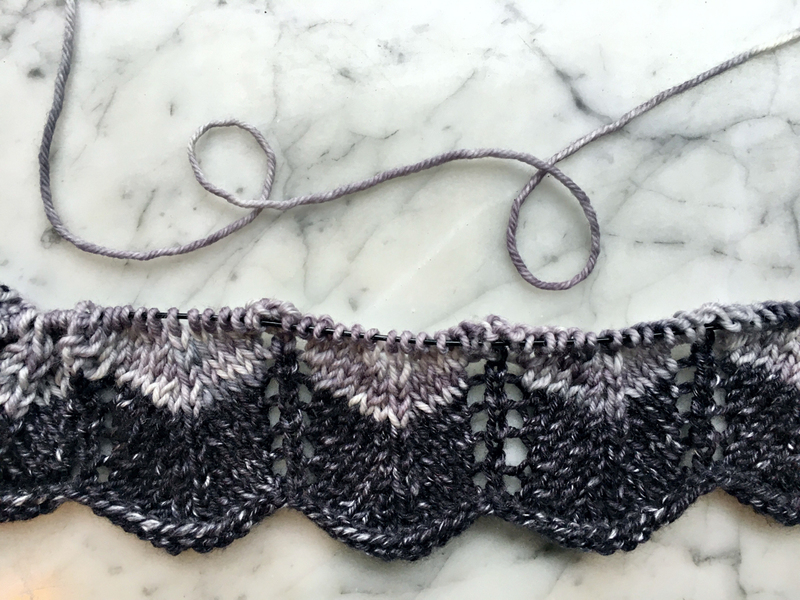 It is easily customizable to make a wider (or thinner) shawl by just increasing (or decreasing) a few rows here and there. 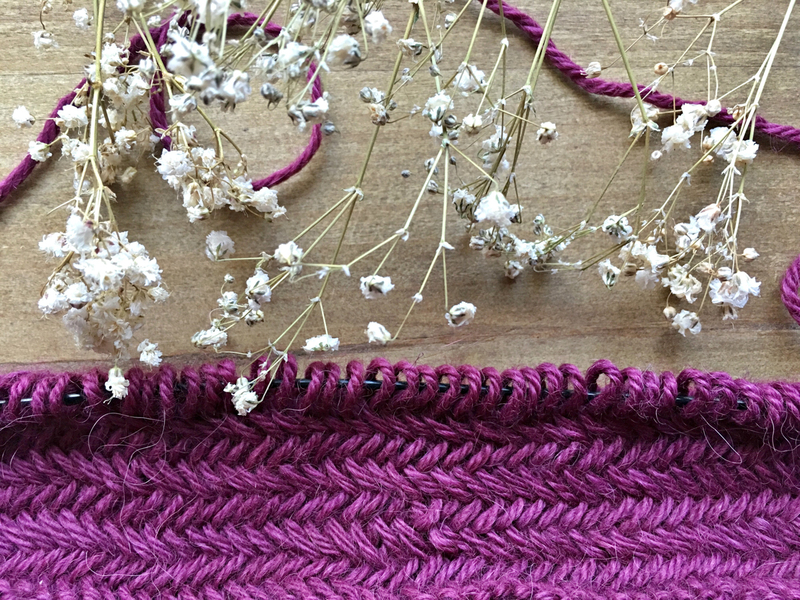 If you want your shawl to be shorter in length, just cast on a multiple of 13 stitches, plus 1 more stitch. I hope this becomes a go-to piece of knitwear for you. So pick up your sticks, and start knitting those bones (herringbone that is). Happy knitting! Using the Long Tail CO method, CO 404 sts with Color A and your U.S. Size 8 (5 mm) circular needles. Cut Color A and begin working with Color B.
R32: Switch to U.S. Size 11 (8 mm) circular needles. Purl across row. Cut Color B and begin working with Color C. You will begin working in the herringbone stitch from here on out. I learned how to use the herringbone stitch with a great YouTube tutorial “How to Do a Herringbone Stitch | Knitting” by Howcast. R33: Knit across row in the herringbone stitch. R34: Purl across row in the herringbone stitch. R35-58: Repeat rows 33 and 34. BO. Cut and weave in all loose ends. 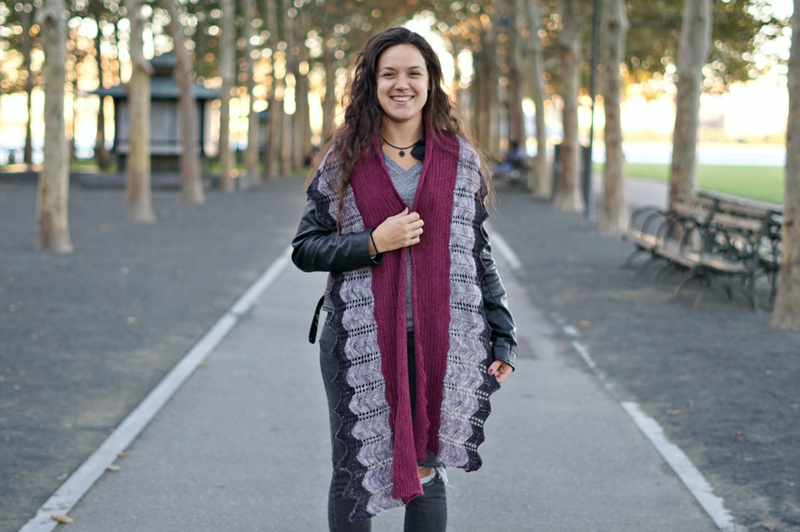 Block your shawl to your liking! I personally suggest pinning down each scallop along your bottom edge to make sure they hold shape and do not curl. I hope you enjoyed this pattern and that herringbone has now become one of your favorite stitches, too! Share your photos and tag me on Instagram, using the hashtags #SticksandBonesShawl and #MadeWithAttic166. 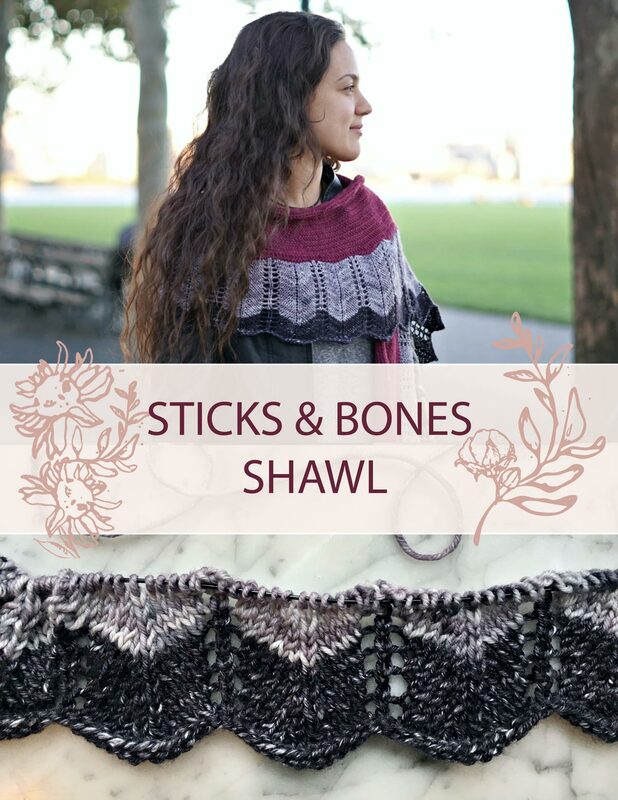 I’d absolutely love to see your own color combinations and versions of this Sticks and Bones Shawl. You can find more of my designs on Ravelry and Etsy. Happy knitting!